Initiate the healing with the new wound dressing Sorelex. and actively initiates the granulation process. Sorelex is suitable especially for the initial phase of the healing process. It effectively removes slough and eliminates production of exudate. Octenidine destroys bacteria, viruses and spores without compromising the patient’s healthy cells. Bioactive hyaluronic acid regulates the inflammatory process and actively promotes the growth of new granulation tissue. This significantly reduces the healing time. Sorelex is a clinically proven dressing. The active substances in Sorelex are completely safe and have no side effects, even in cases of long-term use. Due to it, Sorelex is also suitable for risk groups such as children, pregnant and nursing women, and people with allergies. Sorelex on first contact gently adheres to the wound surface. There is no need to hold the dressing during changing. Sorelex can also be cut and shaped to match the wound. The unique composition of Solerex reduces the frequency of dressing. Depending on the state of the wound, the dressing can be changed every two up to five days. 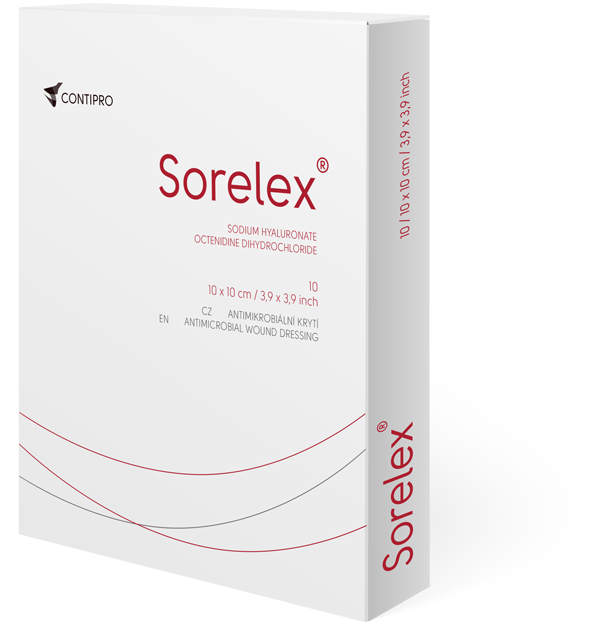 Sorelex is best used in cases where you need to clean the wound bed or start healing quickly. Specialists recommend Sorelex especially for infected, sloughy wounds, long-term non-healing wounds and wounds at risk of infection. It is particularly suitable for moderately and heavily exuding wounds. 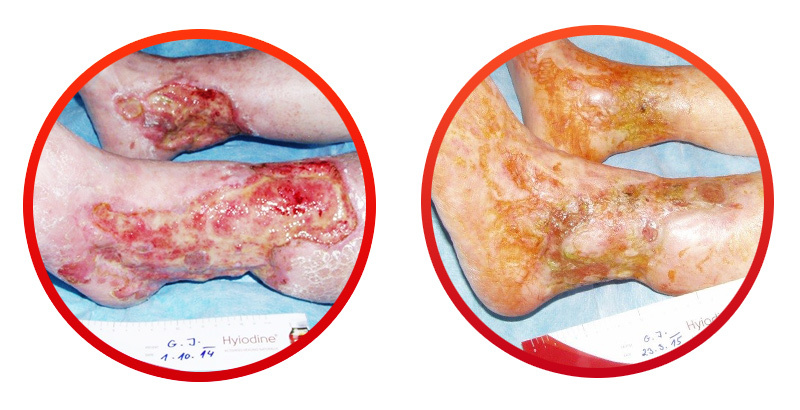 Discover how effective Sorelex in wound healing is. Warning – contains detailed images of wounds! The case of a woman with serious underlying disease (systemic lupus erythematosus, antiphospholipid syndrome, chronic lower-limb ischaemia) requiring permanent 15-drug medication. The arterial leg ulcer was extremely painful. The wound could only be dressed if opiates were administered to the patient. 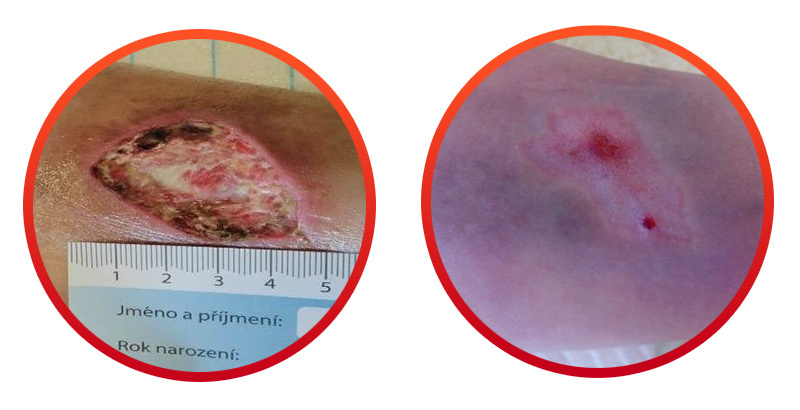 Ms Krpatová, the nurse in charge at Hradec Králové University Hospital, said, that although it was a relatively small wound (5 x 4 x 1 cm), it was a great success for it to be healed completely with Sorelex. This treatment lasted for a total of five months. There are wounds that resist all available treatment and trouble patients for years. Take leg ulcers, for example. 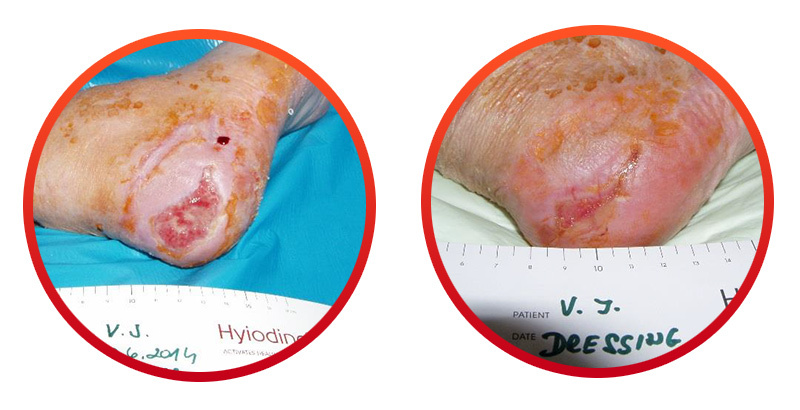 In this case, the patient had been suffering from open and very painful ulcers for 20 years. As no treatment method had proved as successful, amputation was recommended as the best solution. Fortunately, Sorelex appeared on the market at that time and wound were healed over six months of careful treatment. In many cases, a diabetic ulcer is preceded by an entirely banal cause. The rapid progression into a large wound, often complicated by infection, can catch patients unawares. In this case, the chronic wound was caused by a sock that became scrunched up when the patient was wearing shoes. Within days, the small blister had transformed into an infected ulcer. As the patient quickly sought help, the wound was healed by Sorelex without further complications in less than two months. with regenerative effects, and octenidine, a safe antiseptic, delivers quick and discernible results. This is also aided by the sophisticated design of the each layer. Drains excess exudate to a secondary dressing and prevents wound maceration. 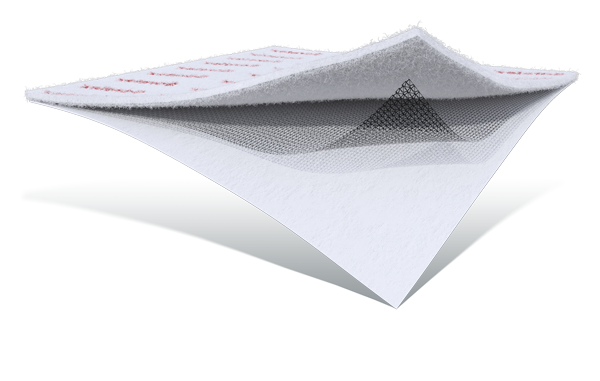 The special grid absorbs dirt and slough and ensures mechanical debridement. The combination of octenidine and hyaluronic acid delivers an antimicrobial and healing effect. It creates an ideal moist environment in the wound. Sorelex is a new wound healing product developed by scientists and doctors. Advanced research has resolved the problem of how to effectively restart the healing process in complicated and chronic wounds. The development of Sorelex has been a collaboration between our researchers at the modern laboratories operated by Contipro, doctors from university hospitals, and other wound healing experts. Sorelex’s revolutionary approach has also come to the attention of doctors in other countries. We make ultra-pure hyaluronic acid from natural substances by means of a biotechnological process. We are one of the world’s largest manufacturers of this multipurpose pharmaceutical and cosmetic ingredient, which we supply to the world’s most famous brands. Our pharmaceutical manufacturing meets the high demands of the Czech SUKL, the US FDA and other control bodies. As a result, patients can be sure that they are receiving the safest and finest quality assistance from us. I use Sorelex at home, so I don’t have to go to the doctor’s so often. I can handle it myself. There are numbers of wound dressings, and I’ve tried a lot of them. Sorelex is my favourite. Because the wounds heal in better way, there are less dressing changes for us. Need to consult a specialist but your doctor’s busy right now?